It would be "folly" for brands to assume that hiding their participation in influencer or native ad deals would lead to higher engagement rates, Christie Dennehy-Neil, senior public policy manager at IAB UK, has warned. Speaking at the Westminster Media Forum on Native Advertising on 21 September, Dennehy-Neil added that research had shown that consumers are quite keen on branded content when it is done well and fully disclosed. The forum, which examined the rise of native advertising and influencer marketing in the UK, also considered the question of whether increasing regulations would undermine the medium’s effectiveness. Most of the forum’s speakers agreed it was possible to regulate clearly and in a way that benefits the public without undermining the medium. "It’s when they learn afterwards, that what they read was in fact advertising, that trust is undermined," Dennehy-Neil added. "And if it’s great content, they will engage with it regardless. Besides, why would you want to produce great content as a brand and not want to put your name to it?" There was, however, some discussion as to the best way to do it. Several, including University of East London professor Jonathan Hardy and Jon Riley, project director, online reviews and endorsements at the Competition and Markets Authority, argued in favour of clearly standardised terms and even a logo that would hallmark paid-for content. This could, however, be too rigid and not fully explain the difference in the ways a brand could be involved, Jo Farmer, head of brands and intellectual property at Lewis Silkin cautioned. Instead, Farmer advocated public education because even when there is a logo, they may not know what it means: "I don’t know that the public is aware that when they see a 'P' on Coronation Street that there is a product placed there. I think that public education has to be part of this." Whatever the method, the goal should be transparency and clarity, Kate Hale, client director of media and digital for Kantar Millward Brown, said in her opening talk at the start of the forum. "If brands and publishers don’t get this right, and if they don’t provide real value, there’s a risk that native advertising will not survive." When considering how best to disclose a brand’s participation, publishers and brands shouldn’t content themselves with ticking a box, Guy Parker, chief executive of the Advertising Standards Authority said. "Brands should ask themselves if there is a possibility for misunderstanding at all. Beware of vague terms." 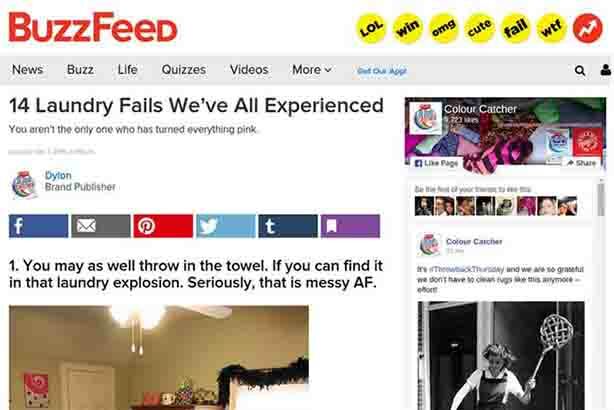 As an example, he pointed to an Advertising Standards Authority ruling against Buzzfeed in 2016 regarding a native ad for Dylon in the form of an article titled, "14 laundry fails we’ve all experienced"
"Although Buzzfeed had the Dylon logo at the top along with the text ‘Dylon Brand Publisher’, and the statement, ‘It’s at times like these we are thankful that Dylon Colour Catcher is there to save us from ourselves’ at the bottom of the article, it was ruled that Buzzfeed had not done enough to clearly identify the article as an ad," Parker said. "Visual cues, a visibly different style or colour background, clear labelling, these are what consumers need. They aren’t here to play detective," Parker said. The age of the influencer may have dawned, but does it help or hinder PR?